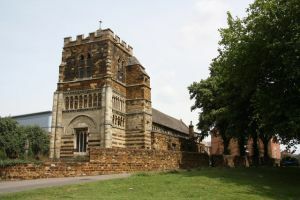 One of the finest Norman churches in Northamptonshire, St Peter's was built around 1150, but there is evidence of a still earlier church in this spot. One of the most interesting features are the carved capitals in the nave, which are wonderfully decorated with carved foliage, birds, beasts, and human faces. The church is composed of an aisled nave, north and south chapels, chancel, and west tower. The bulk of the building is late 12th century, with the exception of the west tower, which was rebuilt in the 17th century. The arcades are Norman work, as are the south, north, and west doorways. Several windows survive from the 12th century, but the remainder is 17th century. The font dates to the 14th century, and there is a 15th-century crypt. Another historical treat is a beautifully carved 12th-century grave slab. There are also a very nice series of 18th wall tablets and a monument to John Smith (d. 1742), a well-known mezzotint engraver. During Sir George Gilbert Scott's restoration work in 1850, a pair of Saxon sculptured stones were discovered in the chancel. They can be seen in a coffin niche in the south aisle. St Peter's is no longer in regular use and is cared for by the Churches Conservation Trust.